If you’re investigating online marketing to make your law firm more profitable, then you’ve come across lots of technical and marketing jargon. All of the acronyms and lingo adds even more legwork to understanding the elements behind what’s a hugely important decision for your firm. Each search engine has its own unique SERP layout, but the essentials are the substantially the same across the major platforms – Google, Bing, and Yahoo!. While you’ve probably seen thousands of SERPs, odds are that you haven’t delved too much into the details of what you’re looking at. At the top of the Google SERP above, outlined in a red box, is the search query box. Very straightforward, the search query box is where you input your query, or what you’re searching for. This is all pretty basic, and if you’ve ever used a search engine, you understand what it’s for and how to use it. There are details to explore here, but we’re only skimming the surface of a SERP so we’ll delve into them in another blog post. In the two blue boxes of the Google SERP are advertisements called Pay Per Click ads, or PPC. 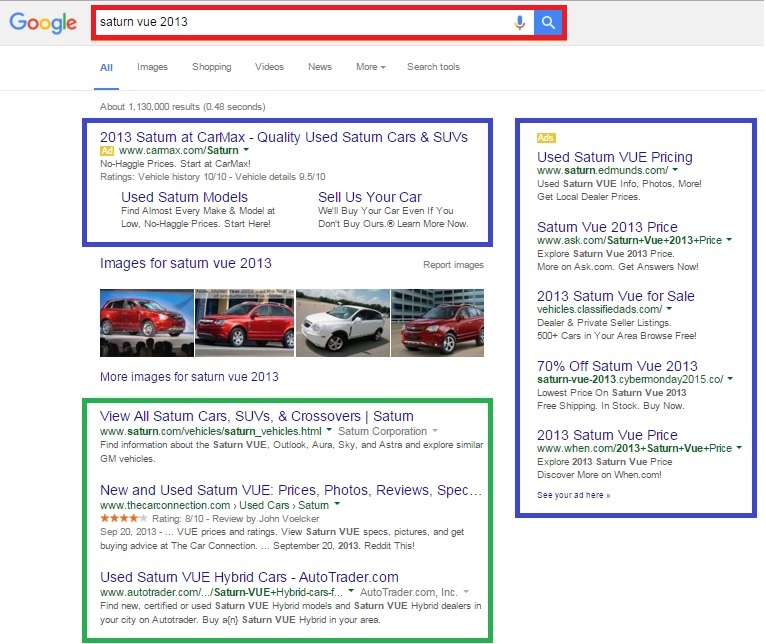 Websites like Carmax.com, Ask.com, and Saturn.Edmunds.com are paying Google money for their websites to be shown whenever someone searches for “saturn vue 2013”. As a result, they get bumped over all of the other websites on the SERP, and claim prime real estate right near the top of it. PPC ad campaigns can be effective, but can also be expensive. Search engines like Google track what people search for. They also understand that being at the top of a SERP for a popular search is much more valuable than being at the top of a search that’s rarely made. As a result, search engines charge different prices for PPC ads, depending on the search you want the ad to appear in. To make matters more complex, a website using a PPC ad to get to the top of a SERP might be overlooked by users, precisely because it’s an advertisement. Whether this is the case, though, is surprisingly complex, and requires an entire blog post of its own. Finally, the websites in the green box of the image above are organic results – the ones that Google has determined to be the most relevant and the most important for the search “saturn vue 2013”. These particular sites are at the top of the organic results precisely because of their quality of their information about 2013 Saturn Vues, as determined by Google’s search algorithm. The process of convincing Google and other search engines that your website is the best one for a particular search is called Search Engine Optimization, or SEO. As search engines try harder to exceed their users’ expectations, they aim more and more to promote quality websites that satisfy their users. As a result, the best way to reach the top of the organic search results has become to simply become the most relevant and most important website out there for a particular search query. The best way for a law firm to become the best website for a particular search query is to maintain a well-written, relevant, and highly focused legal blog. Having that kind of law blog on your firm’s webpage provides room for the type of content that people are looking to read. If your firm’s blog attracts web traffic and creates a good user experience on your site, then your site will get a boost in SERPs over time, increasing your web prominence, building site traffic, and developing more leads to return your investment multiple times over. Myers Freelance writes some of the best legal blogs on the internet. Our professionalism, attention to detail, and knowledge and experience in both the legal and marketing world make us one of the best sources for your legal blogging needs. Contact us online to get started today. This entry was posted in Legal Marketing and tagged Google, Organic, PPC, Search Engines, SEO Terminology. Bookmark the permalink.